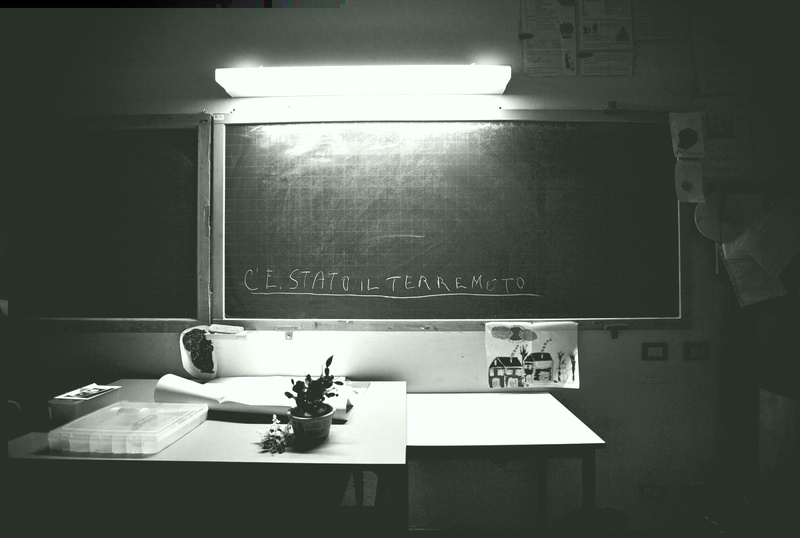 Italy, San Felice sul Panaro, May 2012, primary school.  May 20th 2012 at 04:03:52 a terrible earthquake of magnitude 5.8, duration of 20 seconds and with epicenter in Finale Emilia to 6.3 km of depth, surprises the population in the sleep. The earthquake swarm accompanies for days the people already tired by the first shake. 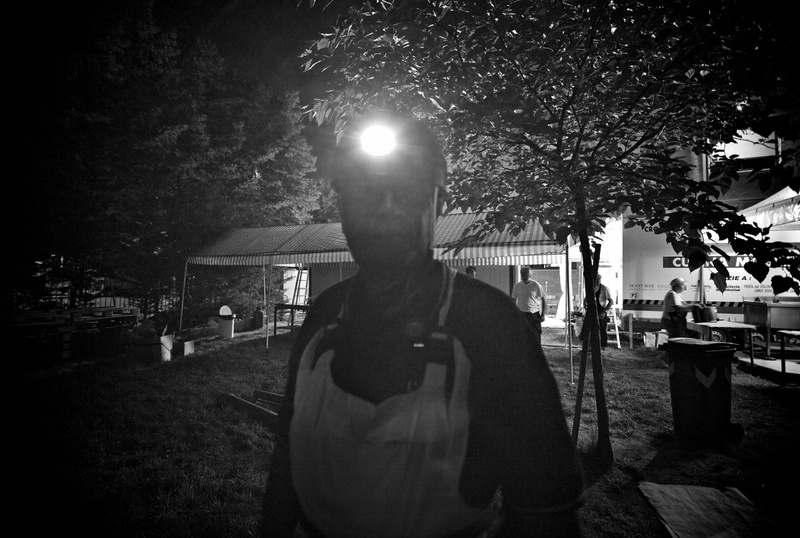 Italy, San Felice sul Panaro, May 2012, Pascoli Camp. 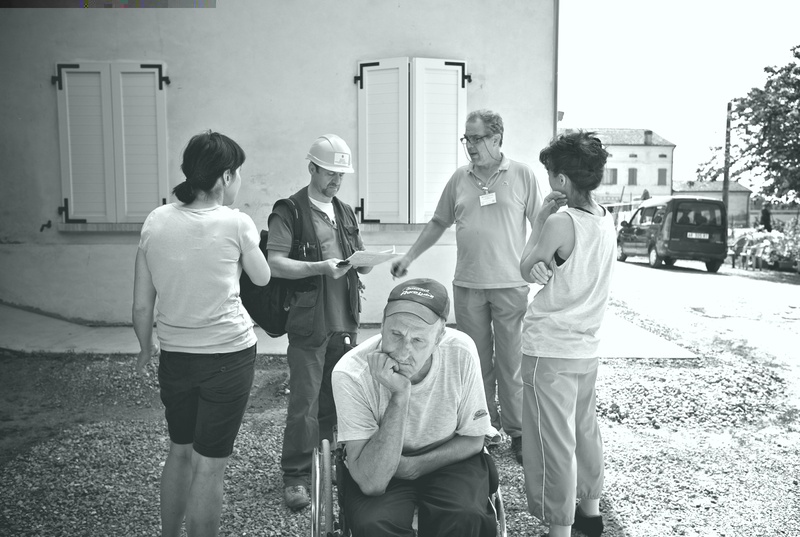 The Pascoli Camp, site near the middle school of San Felice sul Panaro, has been the first camp prepared in the city to put up the elderly from the nursing home and to distribute the meals to the citizens who wore in need of help. 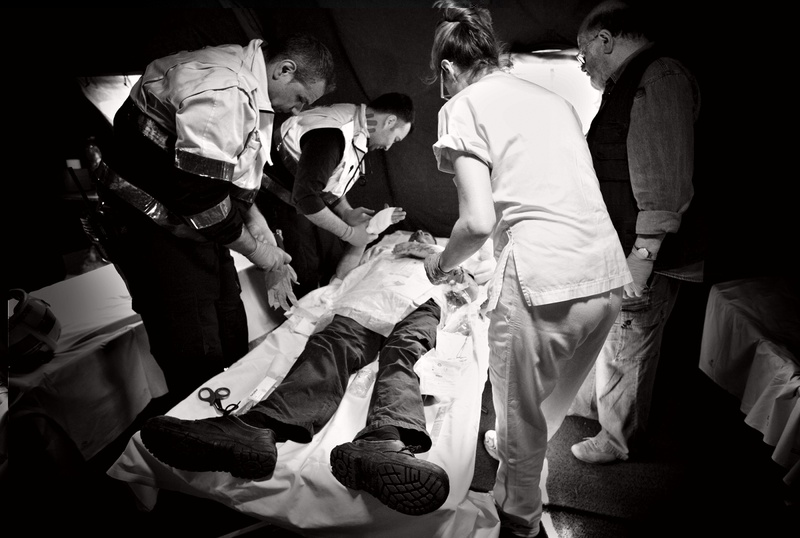 May 29th 2012 at 09:00:03 another awful shake upset the inhabitants making them again fall in the fear and in the panic and after few minutes the first wounded reaches the nearer medical point. Italy, San Felice sul Panaro, May 2012. Italy, San Felice sul Panaro, May 2012, San Giuseppe Artigiano church. The historic preservation protected in the stricken area are 1159 and around 600 of they have been damaged by the earthquake in Emilia.  The buildings have collapsed entirely or par tly or they presents damages of different entity. The general secretariat of the MiBAC has constituted a task force aim to monitor and coordinate the different phases of job for the safeguard of the cultural patrimony. 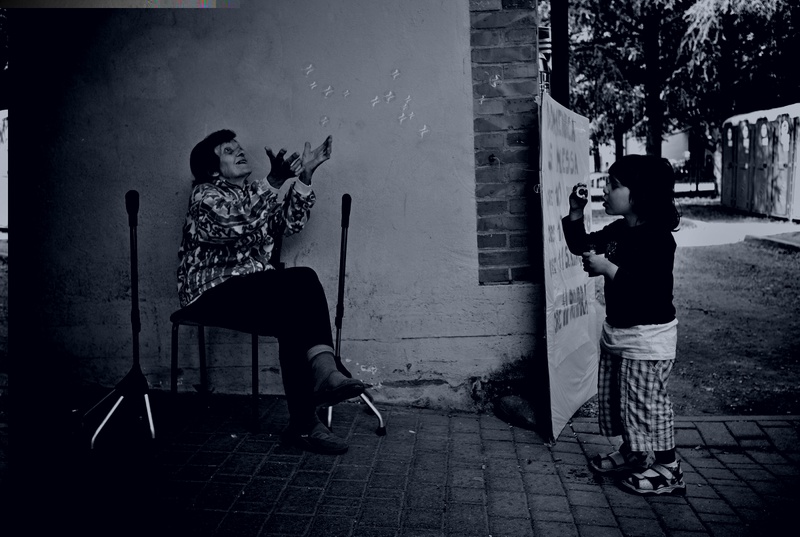 Italy, San Felice sul Panaro, May 2012, META s.r.l. 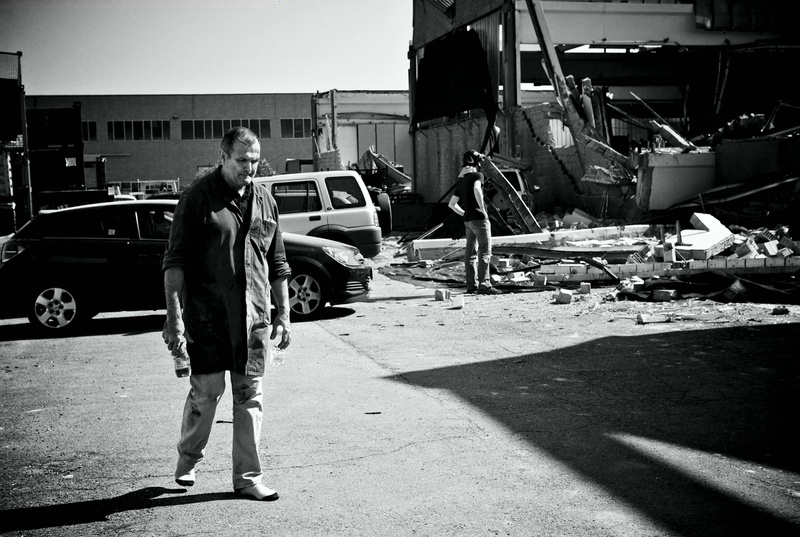 A survivor to the collapse of the factory META few minutes after the shake of September 29 , of magnitude 5.8. Under the rubbles of the factory two workers and an engineer are dead. The engineer had been called by the factory manager to evaluate the safety of the building. 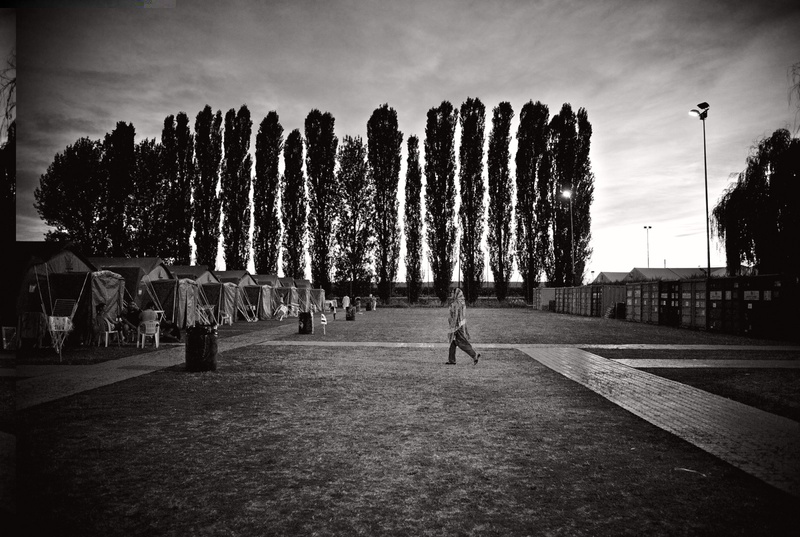 Italy, San Felice sul Panaro, May 2012, Trento Camp. A lot of migrants, come from different countries, lived in crumbling building in the country or in the cities, often in working- class areas and in proximity of historical buildings. 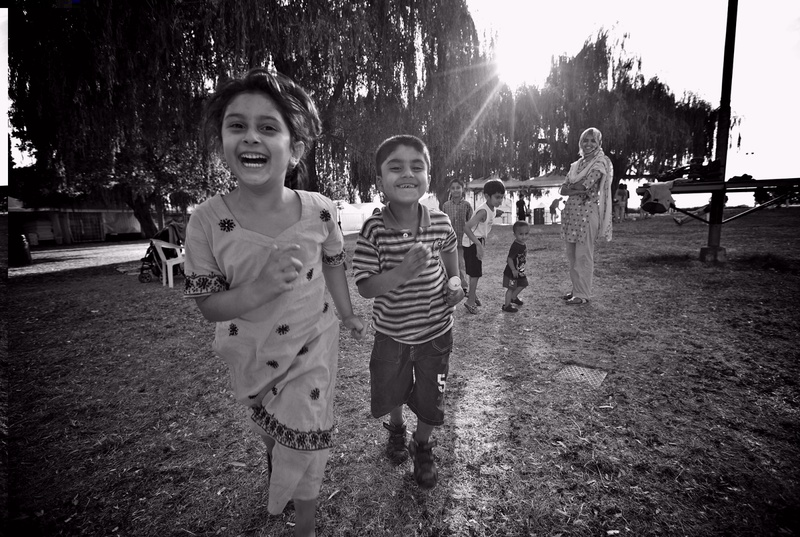 A lot of them found themselves far from their countries and without the support of friends and relatives.They have represented and represent the greatest part of the inhabitants of the camps. 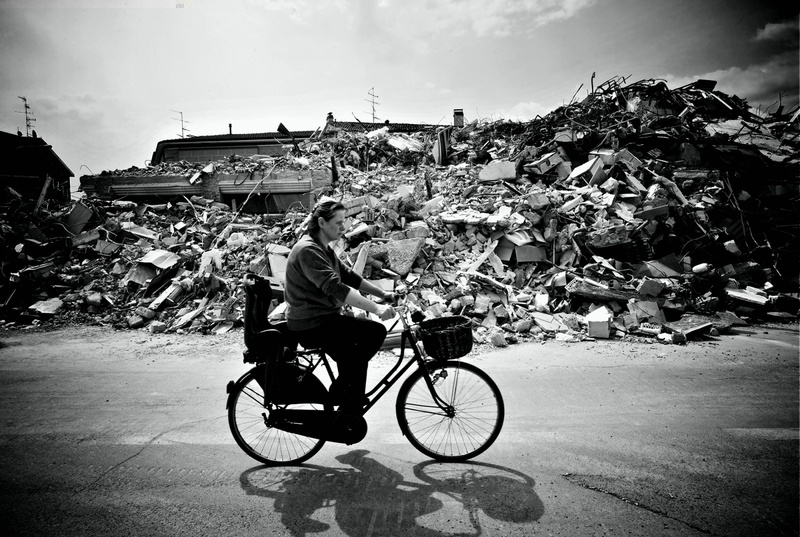 Cavezzo is one of the three towns near Modena most stricken from the ear thquake of 29th May. The ear thquake hasn’t saved anything: historical buildings and new houses have been completely razed to the ground. In the main square of the town a building in which were a clothing store and a commercial office is crumbled. The 60% of the town is seriously damaged and the evacuees are around 5000 people. 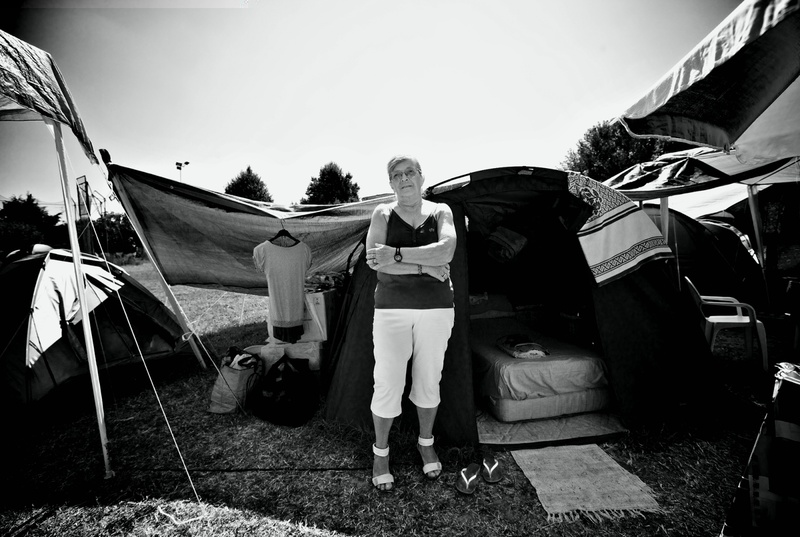 Italy, San Felice sul Panaro, July 2012, Pascoli Camp. In the camps the life continues despite the fear and the small shakes that sometimes upset the serenity of the population.The presence of volunteers of the Civil Protection is essential not only for the management of the emergency in her logistics aspects but also in her psychological aspects. The gym of the school has been evacuated after the shake of May 29 and the guests moved to the tents made available from the Civil Protection. Also the volunteers, that lodged inside the elementary school, had to move to the tents. In less than 24 hours over 40 tents have been climbed and over 400 people have received an accommodation. Italy, Emilian countryside, May 2012. 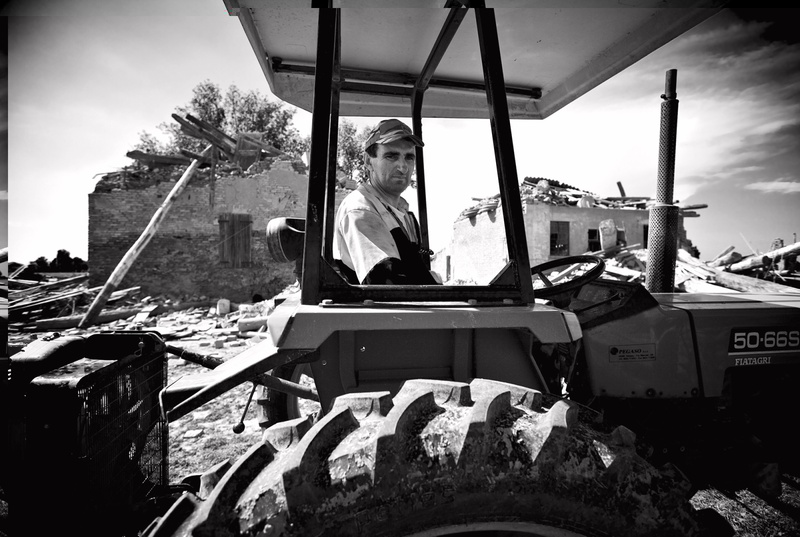 The earthquake hit 7000 commercial farms and around 2000 have been damaged or destroyed and they must be reconstruct. The growers and the breeders are crying out for help to the institutions to be able to save a productive sector which is a driving force for the Made in Italy in the world. The Emilia’s agriculture in the zones stricken by the earthquake is KO. Creamery, wine-producing farm, companies which produced balsamic vinegar and the stores of Parmigiano Reggiano and Grana Padano were damaged. 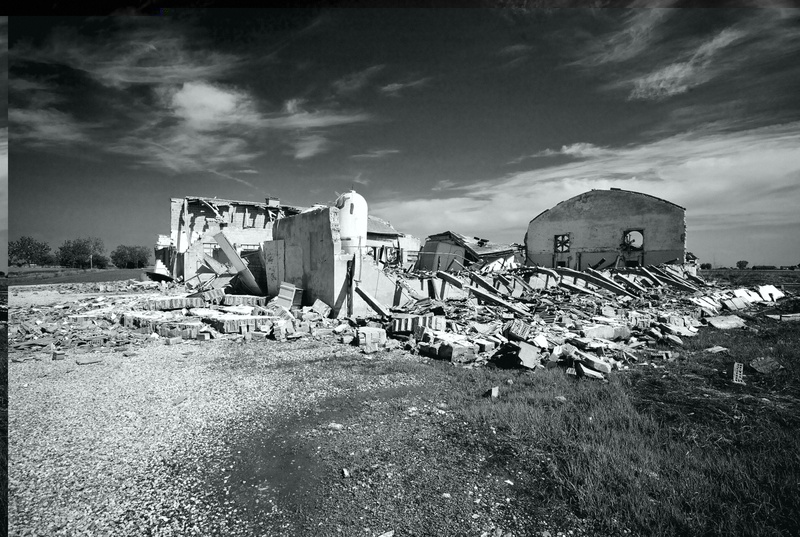 Rural houses, cowshed, barns and machines have been destroyed for a total of 500.000.000 € of damages in the provinces of Modena, Ferrara, Piacenza, Mantova, Bologna, Rovigo and Reggio Emilia. 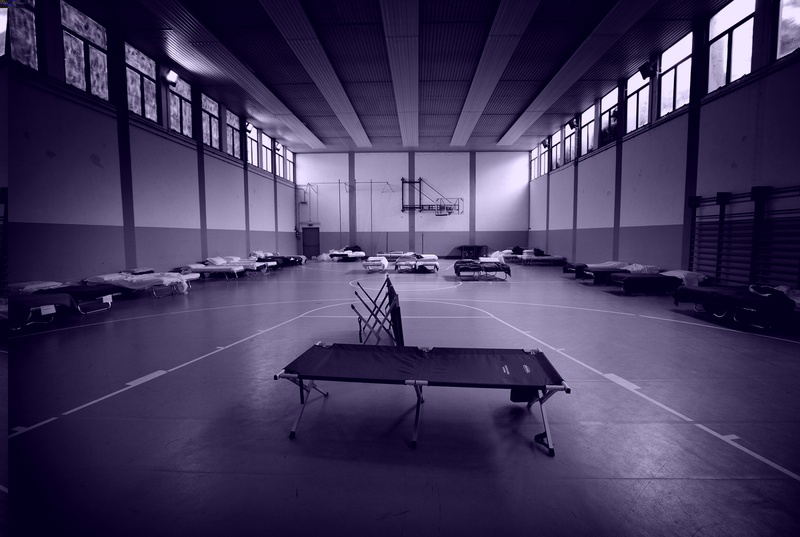 Italy, San Felice sul Panaro, July 2012, Self reception camp inside a sports center. A lot of evacuees have not wanted to move to the camps prepared by the Civil Protection but they have preferred to organize themselves independently. 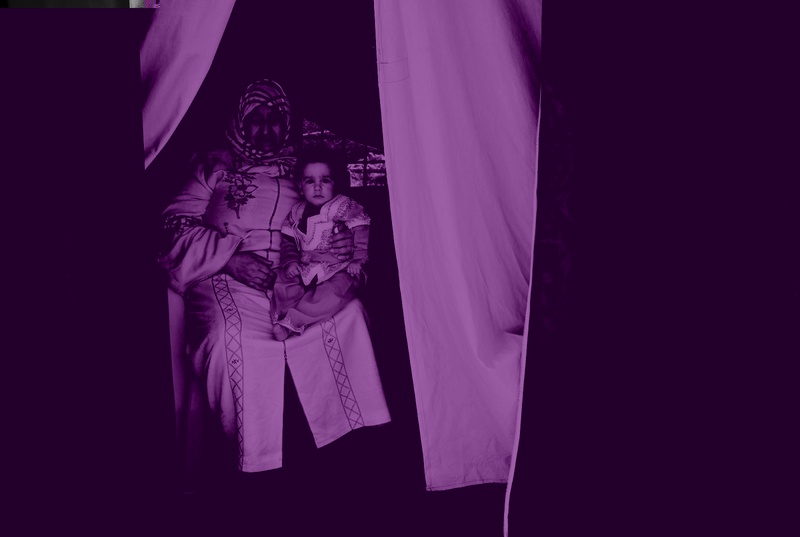 They live in tents or in campers adjacent to their houses or in their gardens. 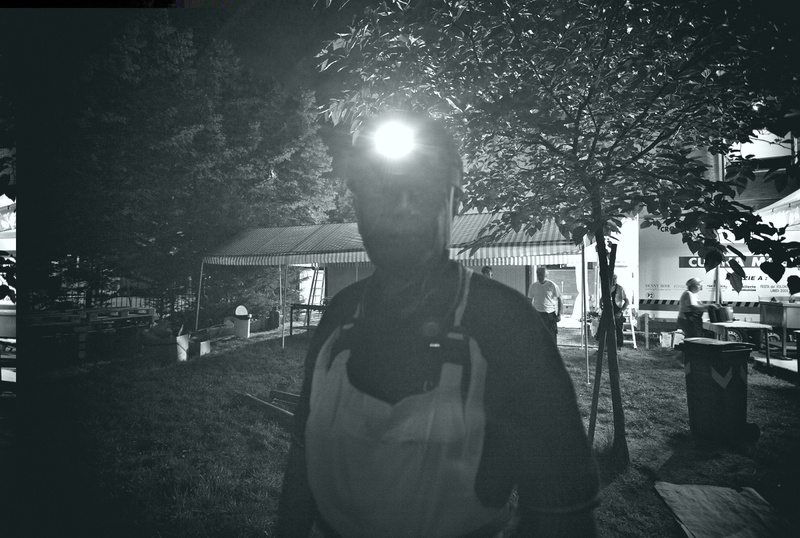 The Pascoli Camp is the only camp that distributes meals to all people that need it. Up to July it has distributed 100.000 meals: a real record of solidarity. 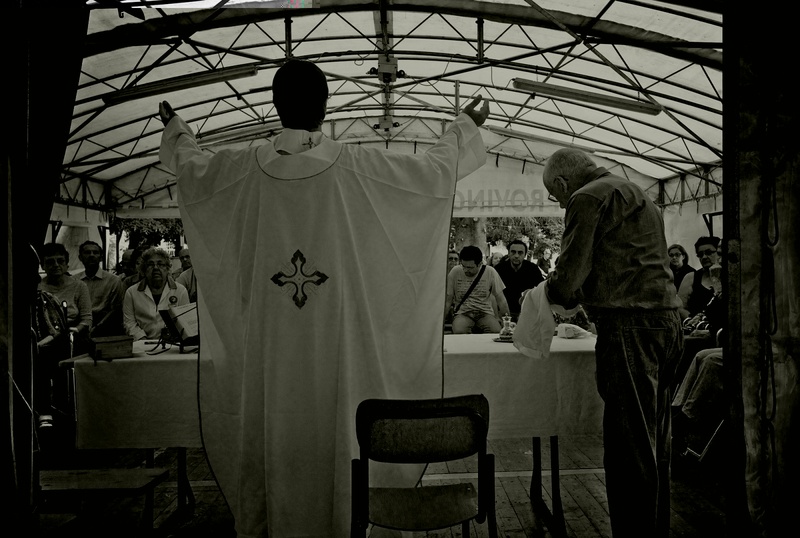 In the same space where the meals are consumed is also celebrated mass for the inhabitants of the camp. Italy, Concordia sulla Secchia, May 2012, Cemetery. 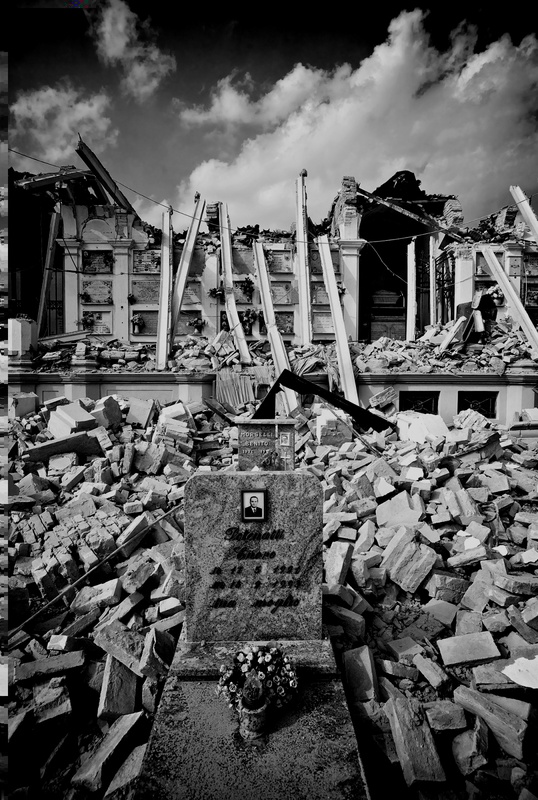 The balance of earthquake is dramatic: 27 dead and at least 350 wounded. 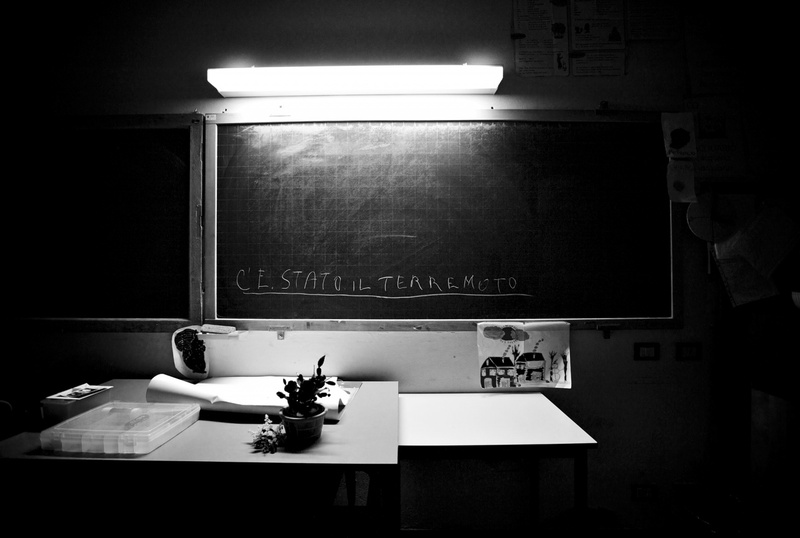 The last dead has been Martina, a 38 years-old woman, pregnant of few months. after the strong shake of May 29 she had accused a strong indisposition, then she had lost her child and she had entered in coma. After having fought for days in the department of intensive therapy in in the hospital of Baggiovara on June 12 she is deceased. Italy, San Felice sul Panaro, May 2012, Saint Biagio in Padule Church. earthquake of May 20 and the perimeter’s walls, part of the sacristy and the chapel of Virgo Maria are still precarious. 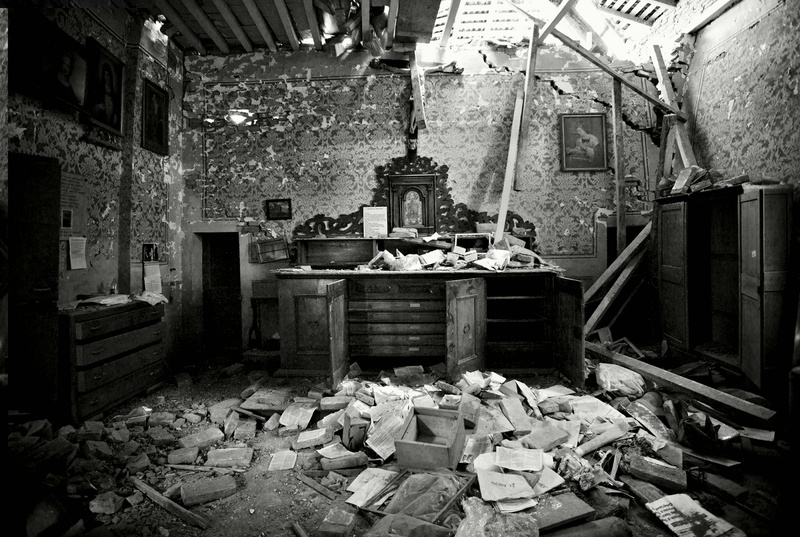 The parishioners have not abandoned their church: since the first moment they have begun the recovery of the historical and artistic goods remained under the rubbles and they have prepared in the old nursery next to the presbytery a provisional parish using objects and religious vestments subtracted to the dust and to the rubble. Incredibly the miraculous tile has gone out unharmed from the collapse. Italy, Rolo, July 2012, Rolo1 Camp. 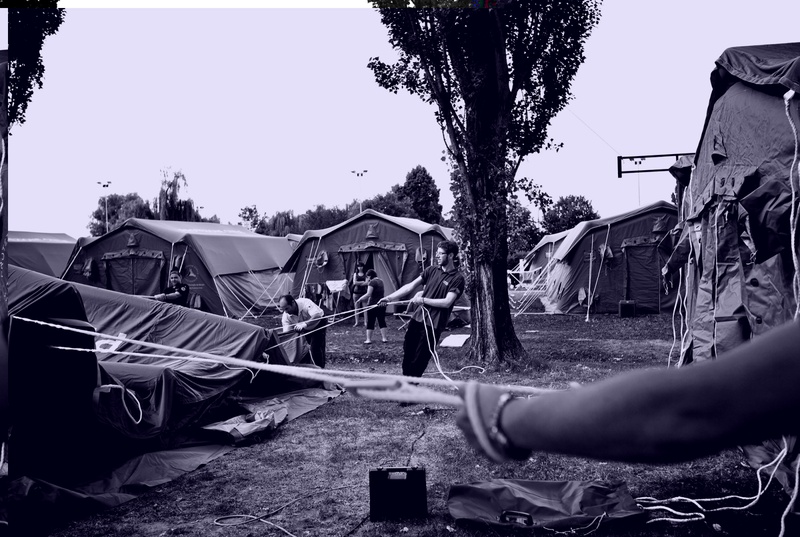 The Camp Rolo 1 have been a small camp out of the town and with mixed management: the Civil Protection looked after the logistic and the direction of the camp, the “Giovani Democratici” of Reggio Emilia looked after the kitchen and the distribution of the meals. The guest were often involved in the organization of the camp’s life. 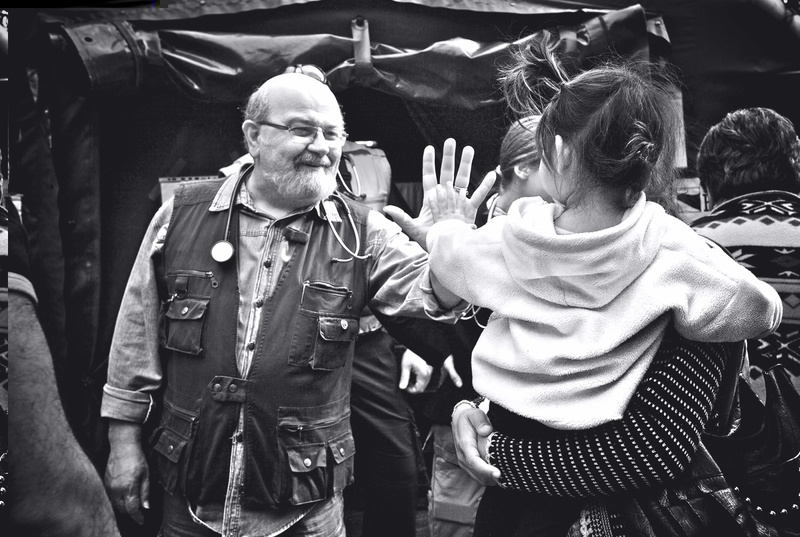 The small number of inhabitants in the camp has allowed that a such unusual management could work without creating problems and so everybody felt more calms, spontaneous and longing for human relationships. This camp has surely represented an unique occasion of exchange and integration among a closed community as the Pakistans one, that almost represented the totality of the guest and the Italian community. Italy, Reggiolo, June 2012, Parco dei salici Camp. Amplification of the camp for being able to welcome the volunteers of the Civil Protection and of the Red Cross who came to bring help to the population. 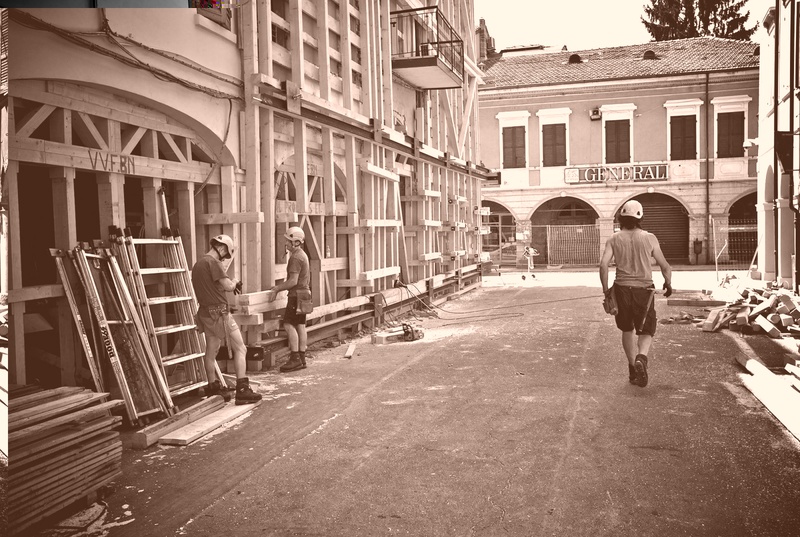 Italy, Reggiolo, June 2012, an inspection by architects. 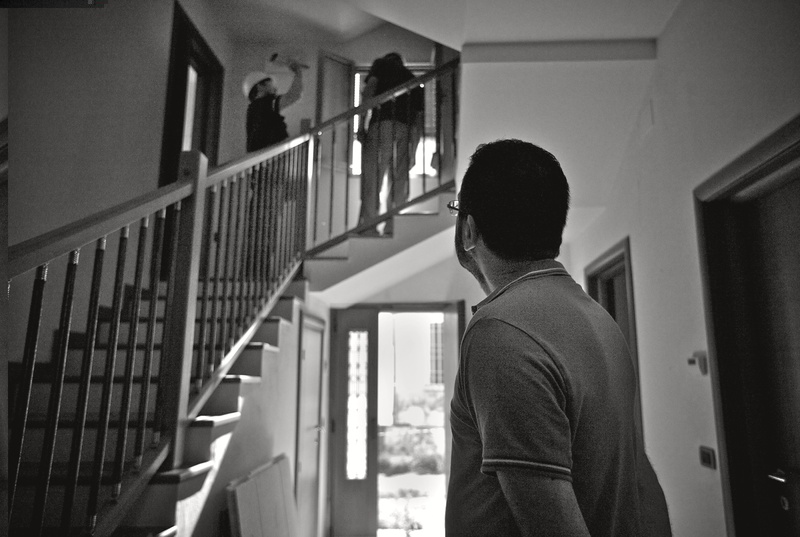 Architects come as volunteers, accredited by Di.Coma.C., after having effected an inspection and having compiled the “Card of 1st level for survey damage, ready intervention of practicability for ordinary buildings in the post-seismic emergency” communicate to the owners that their house is totally condemned and it must immediately be evacuate and secure. 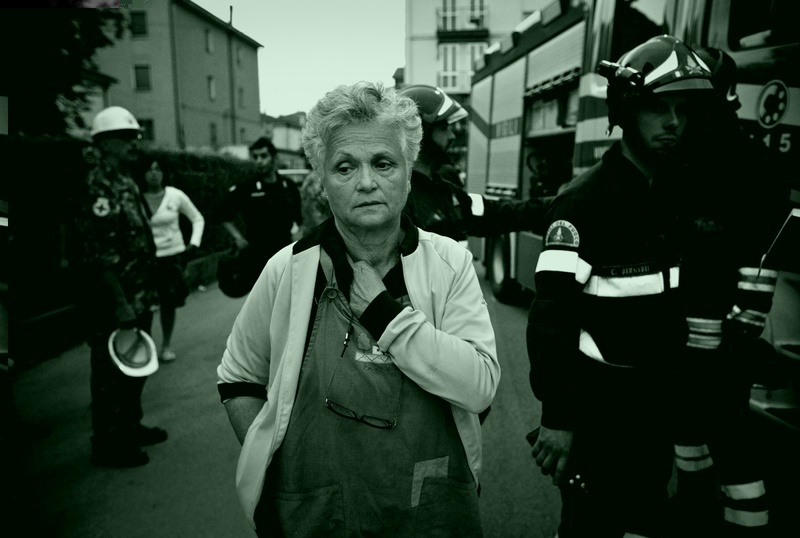 The elderly guest of the nursing home of San Felice sul Panaro have been the first ones to be brought inside the school after the shake of May 20. Few minutes after the shake of May 29 they have been evacuated from the school and settled inside the tents climbed near the building. 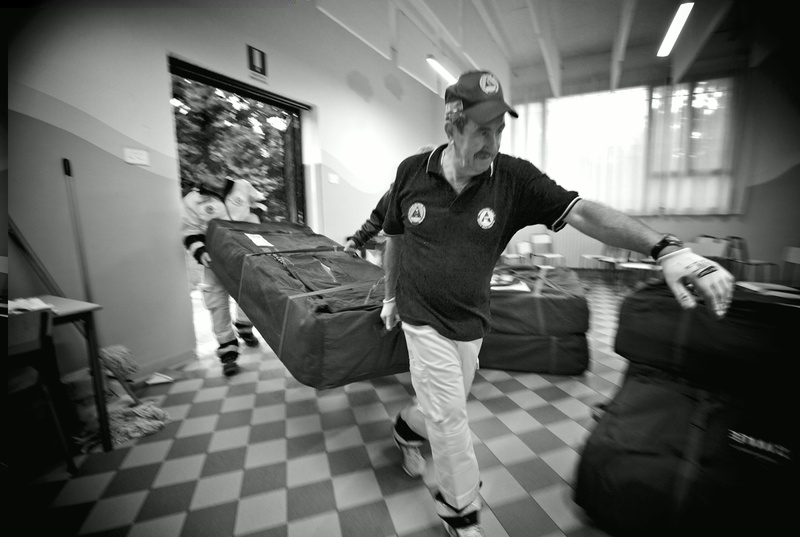 Red Cross, Civil Protection and GEV have collaborated to the preparation of the camp of Reggiolo. The animation for children is submitted to the Pioneers of Red Cross that every day deal with a group of children of different ages and nationality to which they do different activities. have moved to other hospitals of the provinces of Modena and Reggio Emilia. Four PMA in Finale Emilia, Mirandola, San Felice sul Panaro and in Massa Finalese have been activated. In the first two it isactive the assistance of first aid and there are a laboratory for analysis, a laboratory of urgency, ultrasound machines and a mobile radiological center; in the others two work the doctors of Medicina Generale and the pediatricians of Libera Scelta. Italy, Rovereto sulla Secchia, July 2012. 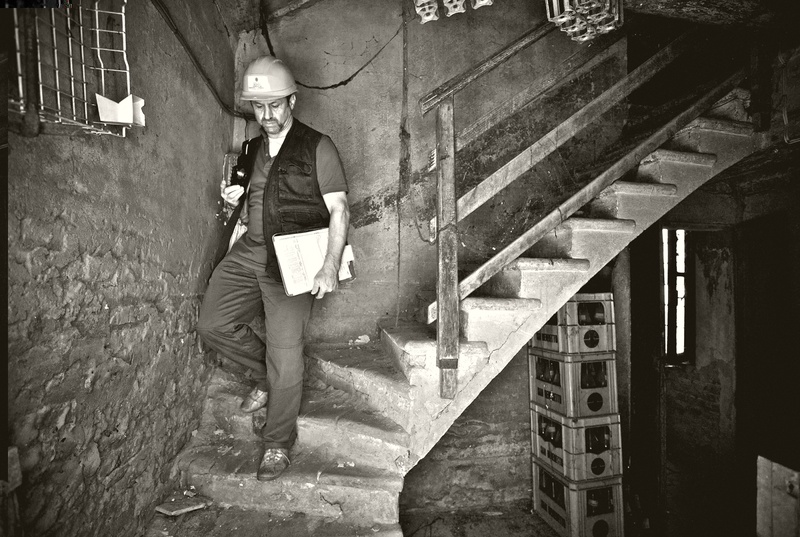 “The detector establishes the condition of risk of the building [...] on the base of the picked information, of the visual inspection and of his own evaluations, relatively to the structural conditions [...], of the conditions of the non-structural elements [...], of the consequential danger from the others constructions [...], and [on the base] of geotechnical situation” (Extracted from “Explanatory notes on the compilation of the card AeDES 05/2000). Italy, San Felice sul Panaro, July 2012. Firemen of the firestation of Trento shore some buildings in one of the central streets of the town, in the historical center, currently considered “red zone interdicted to the population”. In the PMA points operate doctors, nurses and volunteers of the hospital of Mirandola and Finale Emilia, in collaboration with the family doctors of the territory. They do an initial activity of acceptance and evaluation of the patients. 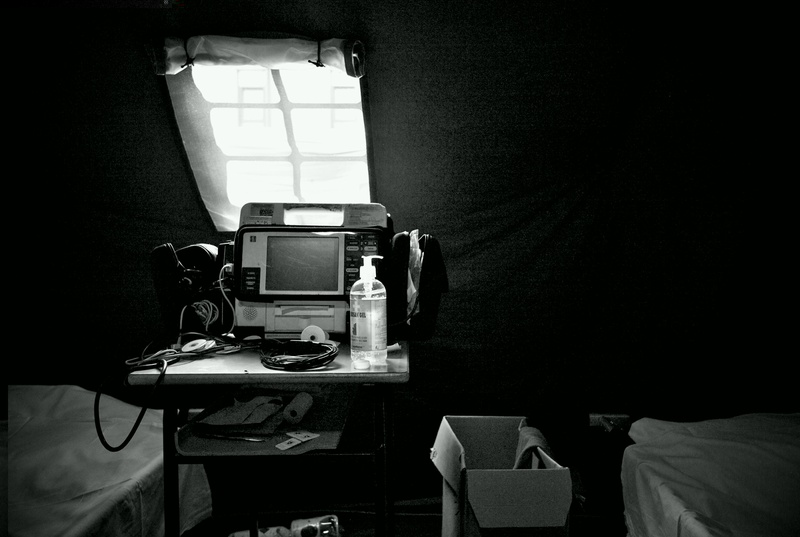 According to the pathology and the gravity the patients are treated on site or are routed to the nearest hospital. 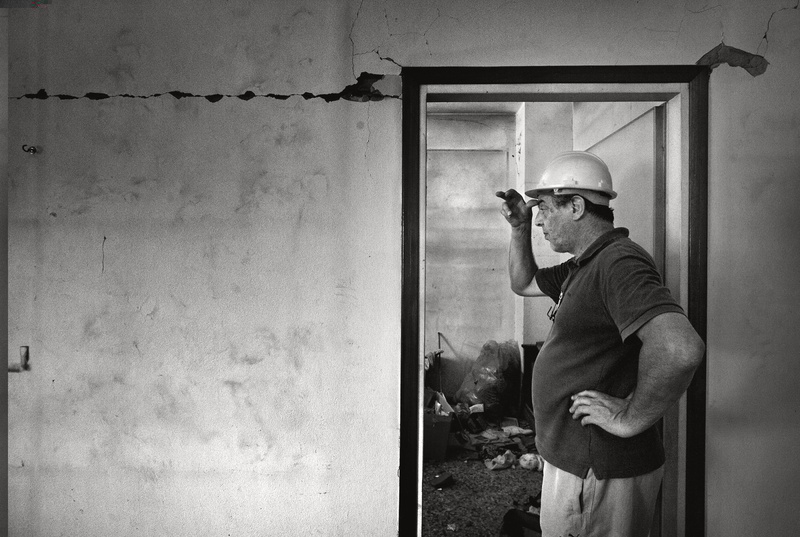 An architect of the order of Rome, accredited by Di.Coma.C as volunteer, makes an inspection to attest the damage and to decree the conformity to standards during the post-seismic emergency. After a careful and accurate visit the volunteers of the Civil Protection compile a card of evaluation and the classify the building. The building has been declared temporarily unusable up to provisions of emergency response. 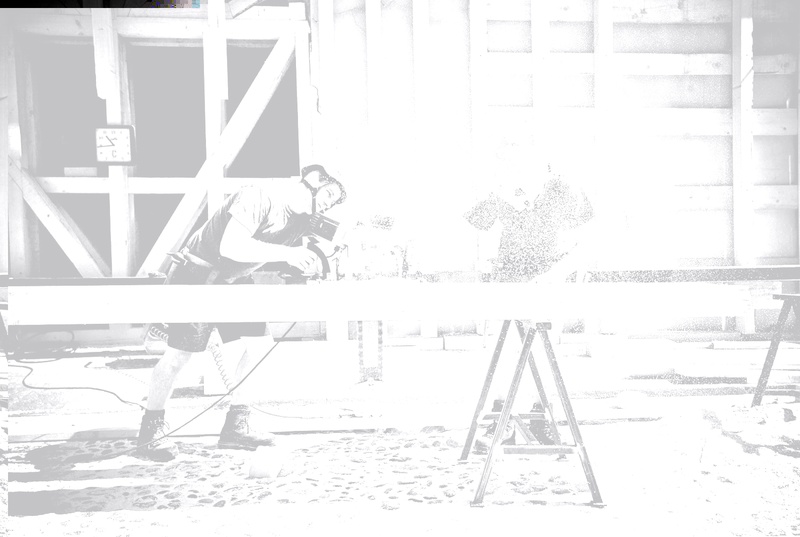 “All the provisional works has been realized in wood and they has been made “collaborating” with the carrying structures of the buildings using steel ropes and filleted bars. All the shorings don’t involved the occupation of the road and so they allow the restoration of circulation in the historical center with consequent release of the red zone at the moment not passable and interdict to the public” (Extracted by the statement nr. 2172 of the Press Office of the Autonomous Province of Trento). 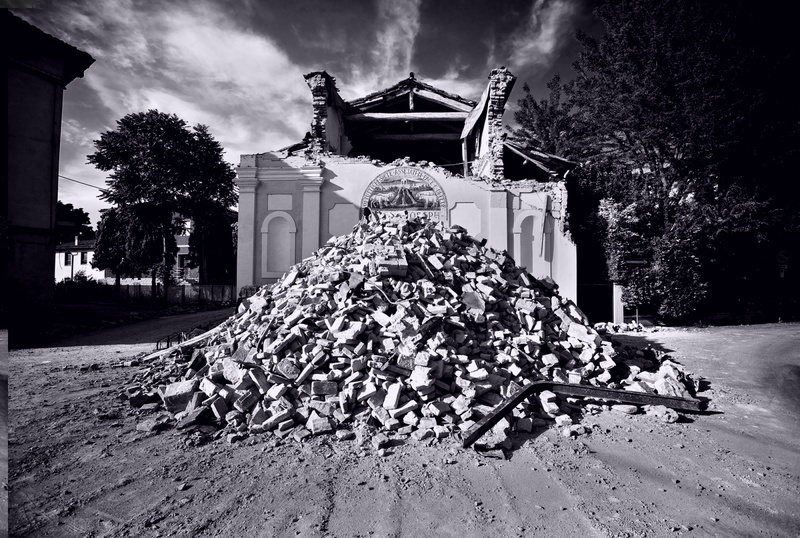 At 15.35 two hundred explosive charge implode the structure of Sant’Agostino town hall which with its enormous gash was become a symbol of the earthquake. 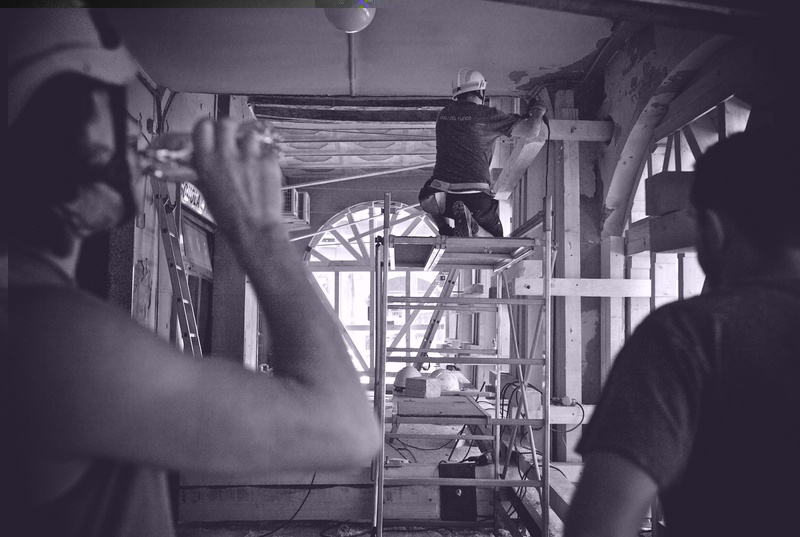 Around one month before the demolition, in June, the firefighters had extracted and saved a precious chandelier in Murano glass, given by Italo Balbo in the 20’s of the weight of over 250 kg.The recovery was possible thanks a machiner y projected from a specialized company and now the chandelier will be restored by a note glassware of Sassuolo. The explosion of Sant’Agostino town hall cancels in two seconds and a half over one hundred years of history. For over one minute there’s only a cloud of wast. On the place Vittorio Sgarbi had come in the attempt to stop the demolition. According to the famous critic of art nobody has provided to save the precious painting contained inside the building.The diffused opinion among the inhabitants was that the demolition was essential, even if painful. 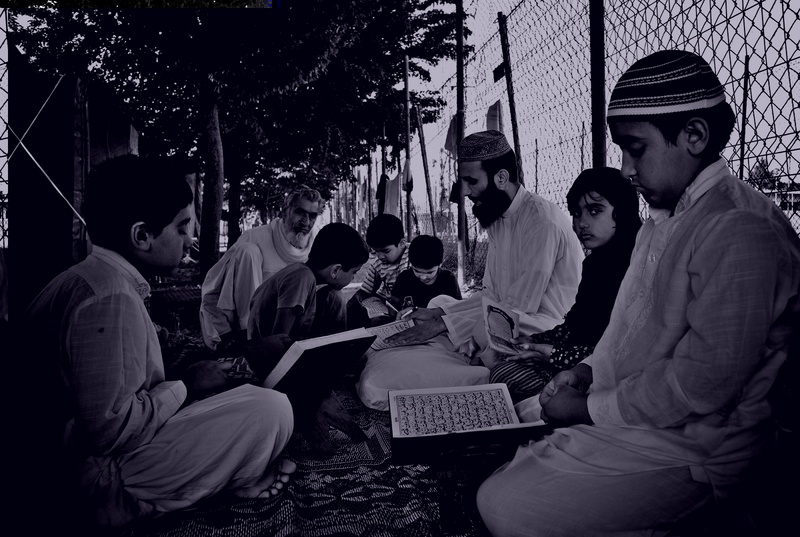 Every day the children participate to a lesson held by an Imam which on purpose goes to the camp. He proposes a formative path on the learning of the bases of Islam, in this way the learning of the language, of the history and of the sacred literature of the Islam is justified. 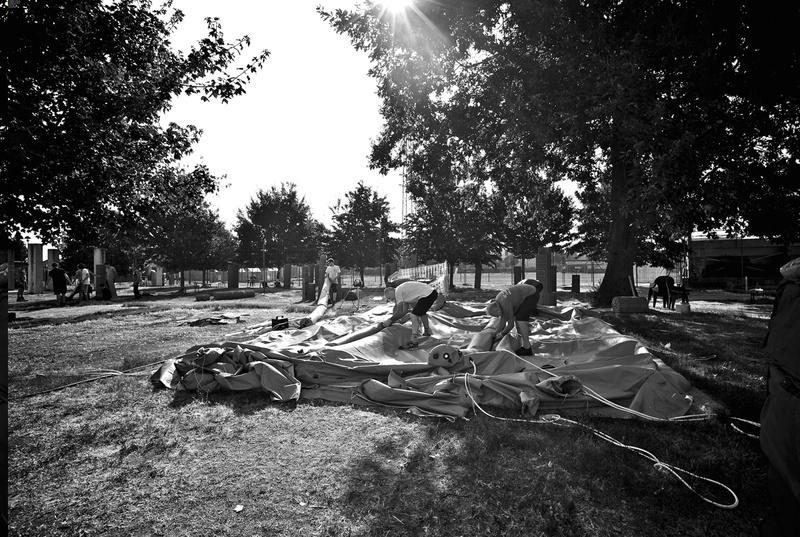 Disassembling of the last tent present in the camp from the volunteers of the Civil Protection of Emilia Romagna. Before beginning the dismantling and the closure of the camp, all the guests have been lived in houses with a regular rental lease and they’ll perceive an economic help of 600€ for month to handle the payment of the lease for the first six months. 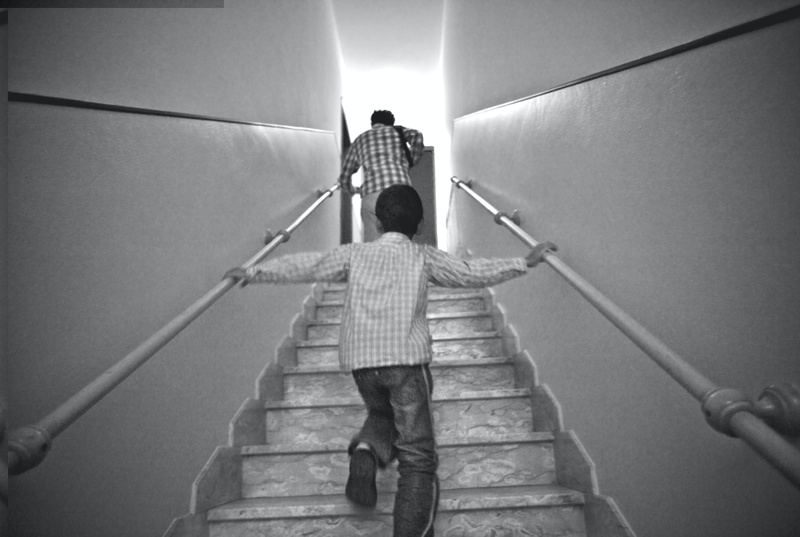 Arfan, a young Pakistan father resident in Italy for some years, races together his first-born to open the house that he failed to get for him his numerous family. The house is 50 m away from the place where he works. At the camp Rolo 1, where they have lived for almost 2 months, they were the last to leave and find a home suitable to their needs. 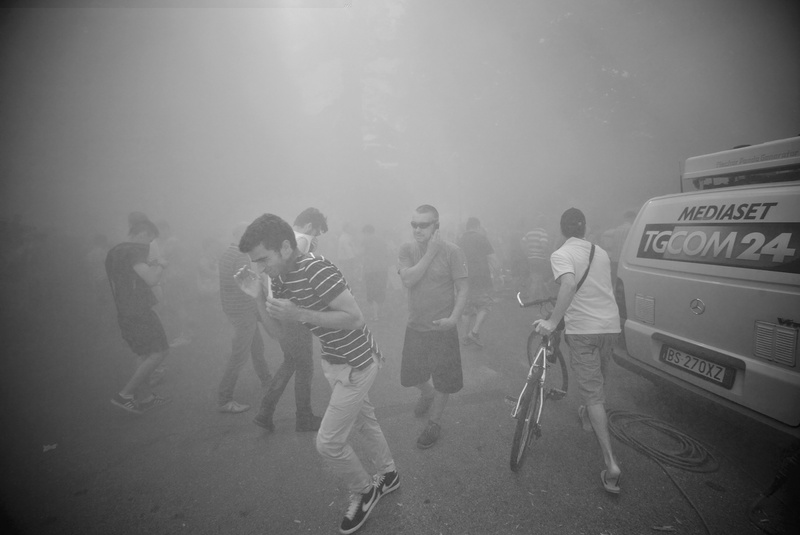 From may 20 to June 20 the firefighters of Trento have come to the aid to the population. Subsequently they have been busy in the removal of the material unsafe, in the inspections to establish the practicability of the buildings and in the shoring of public and private buildings overlooking the main street of the red zone. 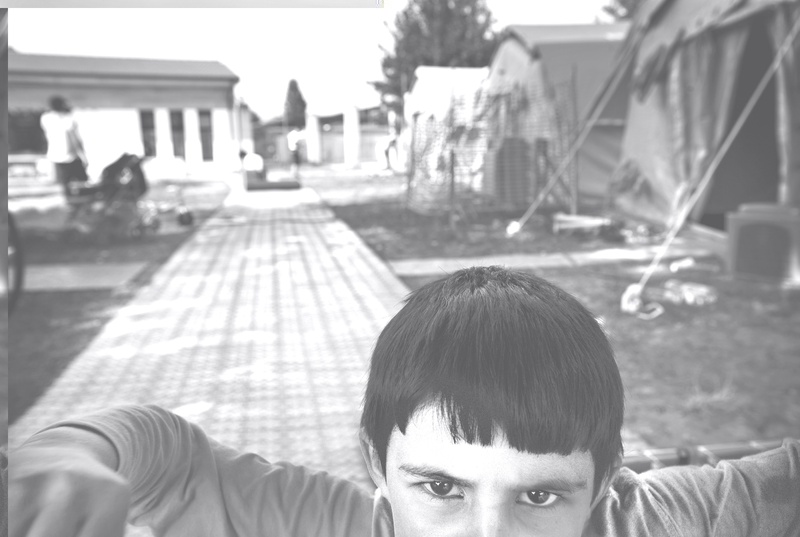 Most of the activities in the camp sited in Reggiolo are managed by Red Cross of Emilia Romagna . 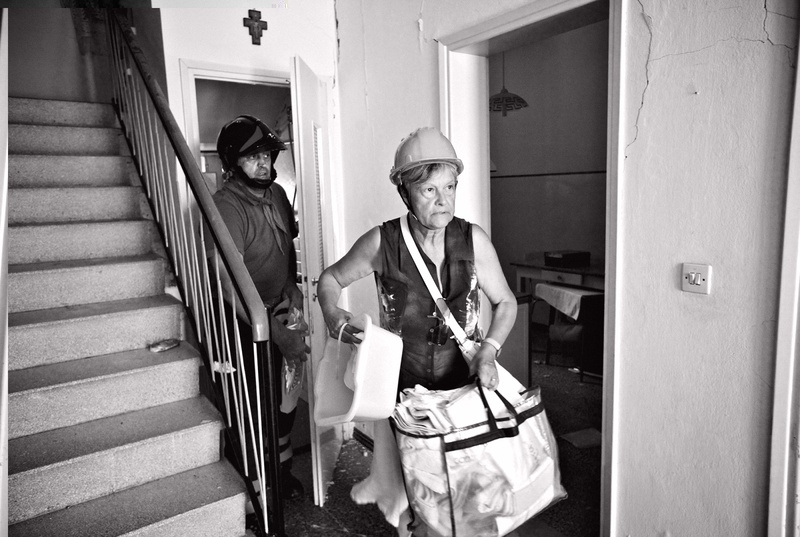 Three months after the earthquake the record of Red Cross shows a strong and coordinated answer with a total of 12.000 operators intervened in the territories struck by the earthquake of May 20. 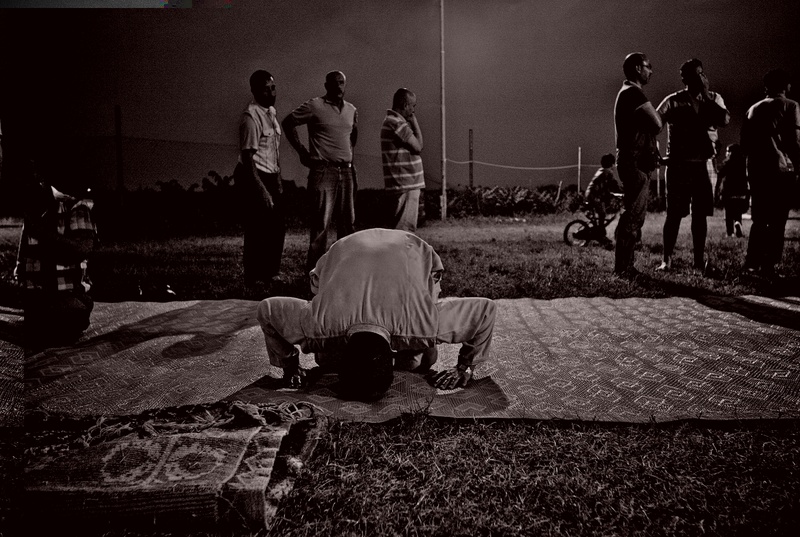 The evening prayer near the tent camp, self-managed and authorized, prepared in the sports ground of Dogaro. Here lived 130 people belonging to four populations. It represents an unique phenomenon of integration and pacific an respectful cohabitation. And also, thanks to the contained number of inhabitants, this camp was able to self-organize and it’s the testimony of a good organization from below. Its inhabitants like to call it “Free Republic of Dogaro”. 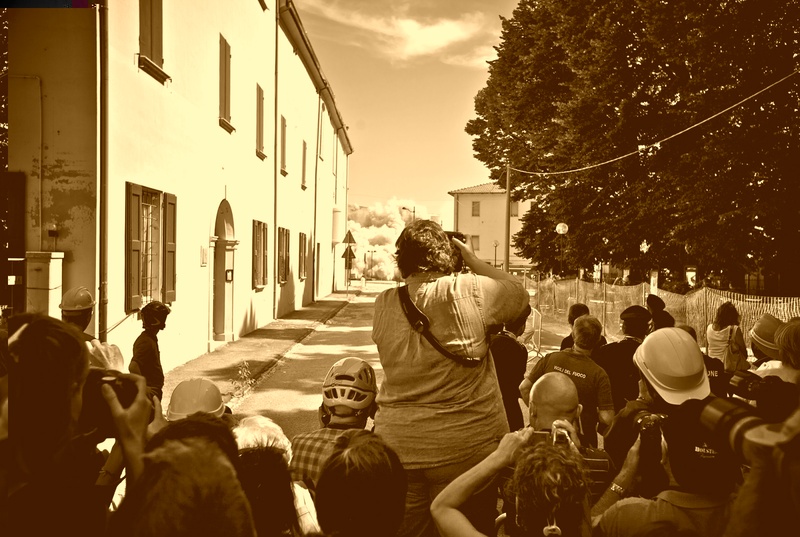 Italy, San Felice sul Panaro, July 2012, Veneto Camp. During the earthquake almost 17.000 people have been assisted and 100 equipped areas have been prepared for the assistance to the population. In the phase of first emergency the number of men and women of Civil Protection who served in these places reached a maximum of 5253 people. 2.5 billion euro allocated in three years and damages are estimated around 13,2 billion of euro. Over 9000 evacuees were able to return home. 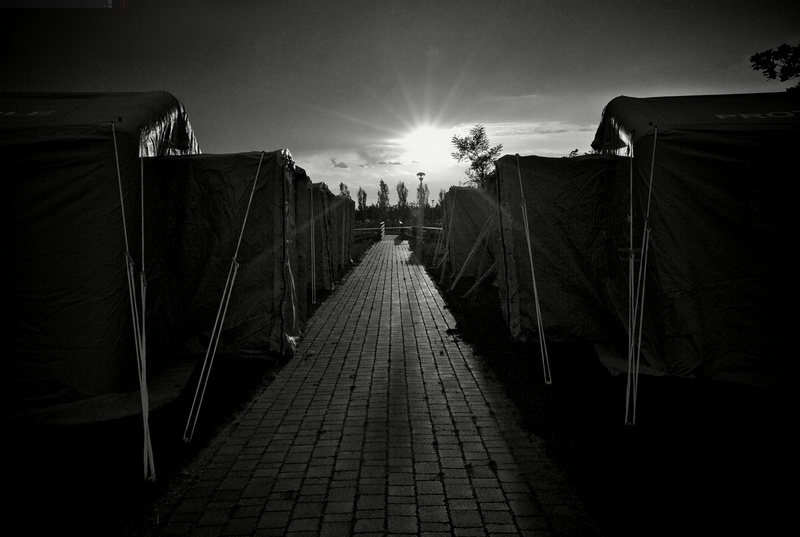 Other 8000 still live in the camps.